Hydraulic components are present in every aircraft. The landing gears, brakes, and other movable components all receive power and lubrication from hydraulic components and hydraulic oils, respectively. 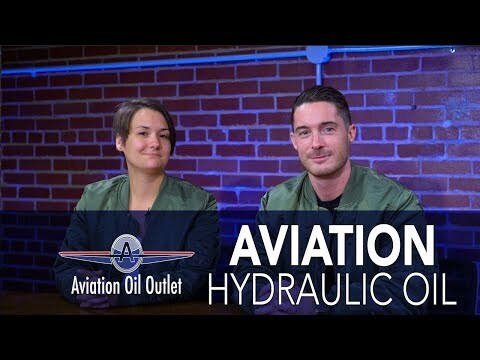 The construction of these components are drastically different than that of aviation engines, therefore, the formulations of hydraulic oils vary greatly from the oils employed in aircraft engines. Hydraulic systems in military aircraft and some larger flying vehicles are sometimes responsible for the control of flaps, weapon bays, and flight control. Premium quality oils are required to protect and ensure proper hydraulic function of these components. These fluids provide the needed force to move heavy control surfaces and are unquestionable necessities to ensure smooth operation. Synthetic and mineral-based oils comprise the base stocks of these excellent lubricants. Generally speaking, these oils have high viscosity indexes, allowing them to maintain a consistent thickness in various temperature conditions, leading to increased protection and performance. These oils usually do not contain zinc or heavy metals and highly resistant to sludge formation.